For students in the Faculty of Music, performing is part of day-to-day business; however, getting the opportunity to perform on a program with a professional Symphony Orchestra is an added value for our budding musicians. 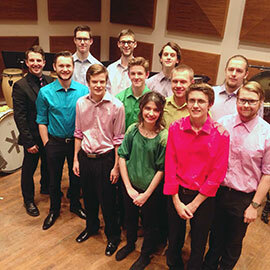 Laurier’s student Percussion Ensemble, led by conductor Brennan Connolly, will perform Bonham by Christopher Rouse during the Guelph Symphony Orchestra’s (GSO) season finale concert, Firebird, May 2 at 7:30 p.m. at the River Run Centre. Bonham is an ode to rock drumming and drummers, specifically Led Zeppelin's legendary drummer, the late John ("Bonzo") Bonham. The core ostinato of the score, played by drum set, is reminiscent of Led Zeppelin's When the Levee Breaks, although there are references to other Led Zeppelin songs as well, such as Custard Pie and Royal Orleans. "As an aspiring orchestral percussionist, the opportunity to play with the GSO is giving me field experience and a taste of how things run both on and off stage," said Dave Klassen, a third-year performance major. "With the GSO season finale highlighting the brilliance of the percussion section, we thought, 'What better way to celebrate than by inviting this group of talented and dynamic musicians from Laurier to join us!'" said Catherine Molina, general manager, Guelph Symphony Orchestra. Tickets are available online at riverrun.ca or at the door. The cost is $20 for adults, $17 for those 29 and under, and $10 for children. The concert begins at 7:30 p.m.